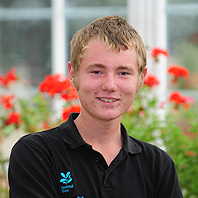 Now studying his Diploma in Horticultural Studies Level 3 and working as a fruit and vegetable gardener. “I can’t say I enjoyed school. The classroom wasn’t for me – I’m dyslexic – and I left with no GCSEs. Because I didn’t have the qualifications, I didn’t make it onto a Horticulture Level 3 course nearer to home. Broomfield was further away, and course leader Mike Baldwin said something like ‘there’s something about you Callum. We’ll start you off on Level 2 and see how you get on.’ I managed to get a distinction and I’m halfway through Level 3 now.